Hacienda Lomajim celebrates the incredible history of Jalisco, dating back to the late 17th century, while welcoming guests for a luxurious experience worthy of today’s travelers. The hacienda began hosting guests in 2009, long after it was built as a private cottage by Juan Ramon Hernandez. The hacienda estate features a mix of both traditional and contemporary Mexican art, with furniture designed uniquely for this space. 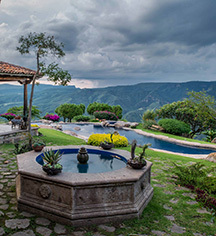 The impressive locale over a hill features awe-inspiring views of the San Cristobal Canyon. The 15-room Hacienda Lomajim is a tranquil and lush getaway, surrounded by trails to nearby waterfalls. The guestrooms are uniquely decorated and include luxurious sheets, ergonomic pillows, deluxe bath amenities by Malin and Goetz, and complimentary WiFi. On-site is an exquisite gourmet Mexican restaurant, wine cellar and bar, year-round outdoor pool, spa center and services, and an outdoor Jacuzzi located on the edge of the San Cristobal Canyon. Hacienda Lomajim is located on the highway to Colotlán, just 50 minutes from the Guadalajara airport. Its location makes it an ideal departure point to visit nearby towns, such as Chapala, Tequila, and Tlaquepaque. 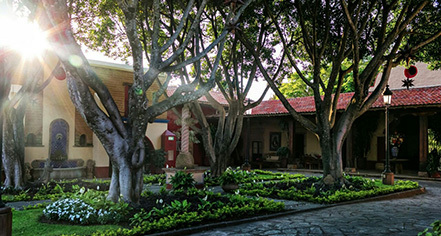 Hacienda Lomajim, a member of Historic Hotels Worldwide since 2016, dates back to the 17th Century. The hacienda has an outdoor Jacuzzi located cliffside that features sweeping views of the San Cristobal Canyon. Pet Policy: Service animals allowed: Please contact property. Pets allowed: No. Hacienda Lomajim celebrates the incredible history of Jalisco, dating back to the late 17th century, while welcoming guests for a luxurious experience worthy of today’s travelers. The hacienda began hosting guests in 2009, long after it was built as a private cottage by Juan Ramon Hernandez. Learn more about the History of Hacienda Lomajim .